"Beth gest ti i ginio neithiwr?" Translation:What did you have for dinner last night? Cinio is both "lunch" and "dinner / evening meal". The inclusion of "last night" (neithiwr) means that the sentence demands the translation of "dinner" and not "lunch". My thought was that he/she was on the night shift. Then it would have made sense. Are you asking if that is an alternate answer? I think there is a problem with Duolingo's correct answer. The sentence mentions ginio ('lunch / dinner'), whereas the answer says 'supper', which should be swper. 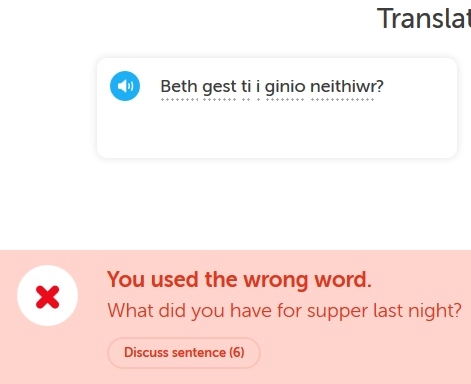 There is a long-standing lack of standardisation in Britain in describing meals at different times of day, and Duo Lingo is never going to solve it! This is definitely some sort of glitch although the other possibility is that you misspelt something in your answer and then the system offered one of the possible alternative correct responses. We added 'supper' as a possible translation along with 'dinner' and 'lunch' for the reason below. The problem for the word 'cinio' is that its translation has evolved over time. It is now considered to be just 'the main meal of the day'. I think I used "dinner', because 'lunch' and 'last night' would not make much sense together. The answer surprised me because in time I did mistake ginio for swper a few times, and Duolingo always prompted me with the correct word. In terms of meaning, 'dinner' and 'supper' would not make much difference, so it is merely a question of keeping the translation literal. There are 12 other alternatives, 4 of which have 'supper' in. The most likely reason for you to get the messages was that you misspelt one of the words but not 'dinner'. Since you would have spelt dinner correctly the system chooses randomly one of the other answers with the correct word in. There are other explanations, such as the system having an old, previously deleted version of this sentence or that there was some technical problem with the system.